The following guide demonstrates how filters can be used for service calls, activities, and technicians. For more information on filters, please refer to the following guide. 1 “Select view” button Allows to select a filter previously saved. Any combination of filters previously saved is called a “view”. 2 “More” button A more button allows to select a combination of filters that will therefore reflect the displayed entries (activities, ) in the UI. 3 “Filter settings” button The filter settings button allows to Save a filter as view for further usage, reset all chips displayed and clean the selection or create more advanced filters. 4 “Chip” A chip is each selection of filters selected via the “More” button. For each filter selected via the “More” button a new chip is added. 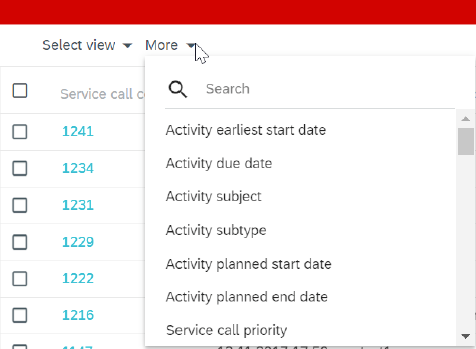 The newly implemented filters are now displayed on top of the planning board, on top of the planning list, on top of the activity list and on top of the service call list. This makes the usage more intuitive compared with the previous implementation. Filter capabilities have been extended as well with more options. Activity earliest start date The earliest start date of the activity. Activity due date The due date of the activity. Activity subject The subject of the activity. Activity subtype If applicable, the subtype used to categorize the activity. Activity planned start date The planned start date of the activity. Activity planned end date The planned end date of the activity. Service call origin The origin of the service call (example: email, phone, etc). Service call subject The subject of the service call. Service call remarks If applicable, any remarks entered for the service call. Service call problem type The problem type used to categorize the service call. Service call code The unique code associated with the service call. Service call territory The territory associated with the service call. Service call customer code The customer code associated with the service call. Service call start date The start date of the service call. Service call end date The end date of the service call. Service call created date The date on which the service call was created. Service call skills Any/all skills associated with the service call. Activity Project Code If originating from the Project Management app, the project code associated with the activity. 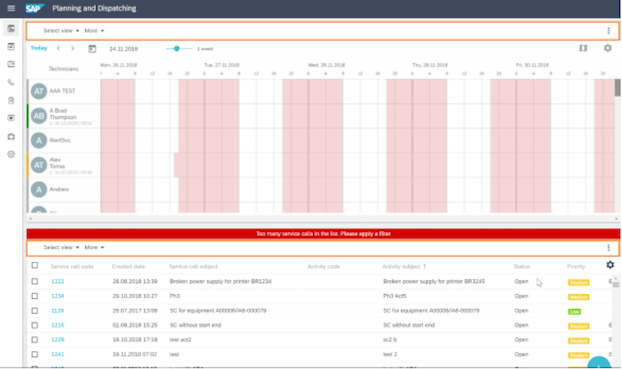 Activity Project Subject If originating from the Project Management app, the subject of the activity. Activity Project ProjectType If originating from the Project Management app, the project type used to categorize the activity. Responsible If released, the employee assigned responsibility. Activity Zip code The zip code associated with the activity location. Equipment code The equipment code associated with the activity / service call. Equipment name The name of the equipment associated with the activity / service call. Equipment serial no. The serial number of the equipment associated with the activity / service call. Equipment Manufacturer serial no The equipment manufacturer serial number associated with the activity / service call. All Activity UDF Any / all user-defined fields associated with the activity. 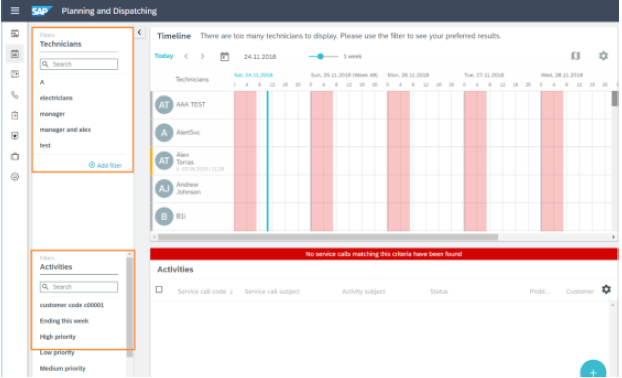 All Service call UDF Any / all user-defined fields associated with the service call. To change the selection on a particular chip click on the chip itself and change your selection. In case you need to create more advanced filters you can switch to the “Advance Filter” mode. 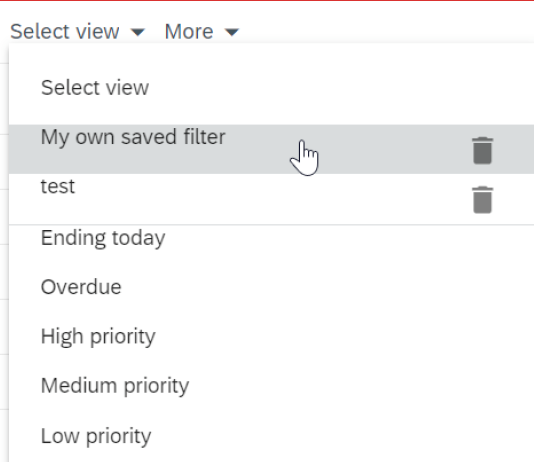 Note: after saving an advanced filter is not possible anymore to switch to a basic filter view. 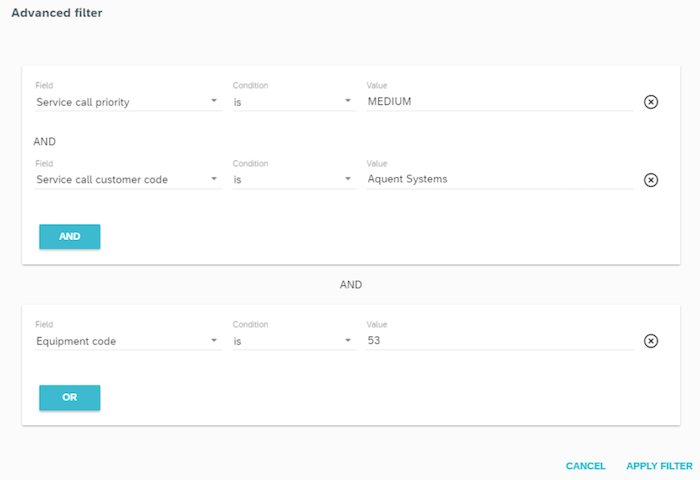 Depending by the “Field” selected and the “Condition” selected in the advanced filters the possible options change dynamically. After the advanced filter is specified, you can click “Apply Filter” selection. Now, when clicking on this filter, you will be prompted with the advanced filter. 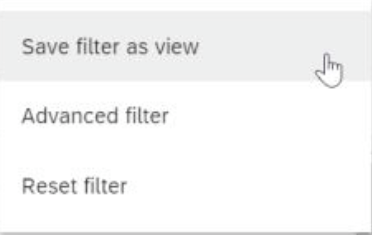 To save the advanced filter, you can proceed in the same way as you did for a basic filter.